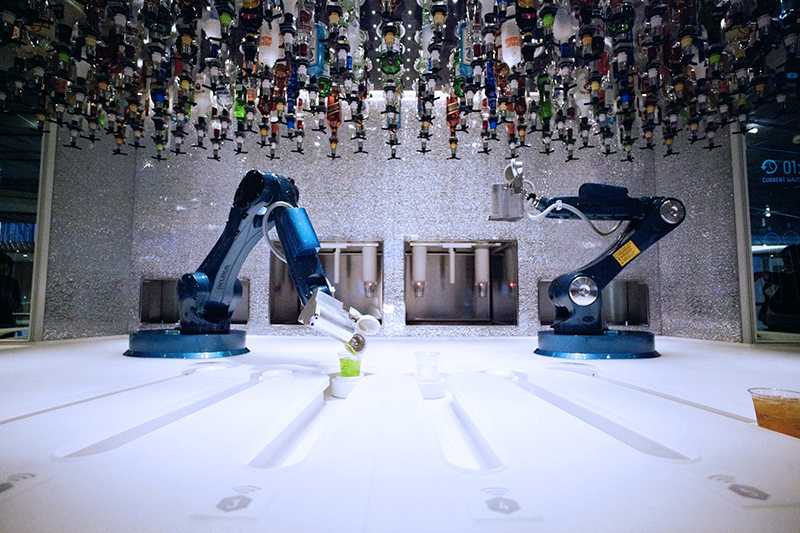 Yesterday Makr Shakr, the world’s first robotic bartending system – designed by renowned architect, engineer and inventor, Carlo Ratti – made its debut as the Bionic Bar onboard on Royal Caribbean’s new ‘smart’ cruise ship, Anthem of the Seas, in Southampton. Makr Shakr is an exciting and innovative new mixology system that allows users to create personalised cocktail recipes in real-time through a smartphone application – also transforming them into crowd-sourced drink combinations. The Bionic Bar powered by Makr Shakr is located at the centre of Royal Caribbean’s new Anthem of the Seas latest ‘smart’ cruise ship. To use Makr Shakr, users will access a simple app on a tablet, allowing them to create an almost limitless number of alcoholic and non-alcoholic drink combinations. The cocktail creations will then be assembled by two robotic arms, whose movements – shown on a large display positioned behind the bar – mimic the actions of a bartender, from the shaking of a martini to the thin slicing of a lemon garnish to the muddling of a mojito. Guests will have the possibility to name their own recipes, access their order history and reorder their favourite cocktails, while rating and commenting on each other. “Makr Shakr does not suggest replacing the bartender with a robot, but rather was conceived as a social experiment that looks at how people might embrace the new possibilities offered by robotics and digital manufacturing” says Saverio Panata, COO of Makr Shakr. In Makr Shakr, social connections are woven throughout the co-creation and mixing of ingredients, which are then fed back to the user through the app. With this new technology, consumers can learn from each other, sharing connections, recipes and photos on social networks. “Digital connectivity is not replacing physical interactions, but rather reinforcing them” adds Panata. To create an engaging bar experience, the robots’ movements were modeled on the gestures of Italian choreographer Marco Pelle from New York Theatre Ballet. Mr Pelle’s movements were filmed and used as inputs in programming the robots’ animation.